(16/P111) TRENTON – The Department of Environmental Protection today joined with federal and local officials to mark the completion of a state-of-the-art flood-control culvert that will protect communities surrounding Monmouth County’s Wreck Pond as part of the Christie Administration’s comprehensive efforts to make New Jersey more resilient to storms and floods. During today’s dedication ceremony, DEP Deputy Commissioner David Glass was joined by U.S. Rep. Chris Smith, Spring Lake Mayor Jennifer Naughton, U.S. Fish and Wildlife Service New Jersey Field Supervisor Eric Schrading, American Littoral Society Executive Director Tim Dillingham and other officials associated with the project. The Christie Administration launched the $7.4-million lake restoration project in July 2015, as a collaborative effort involving many partners. The cornerstone is the 600-foot-long concrete culvert restoring tidal flows between the ocean and the 73-acre pond. The pond’s natural inlet was filled in during the 1930s. A pipe constructed at the time to connect the ocean and lake restricted tidal flows, exacerbating flooding and leading to degraded water quality. 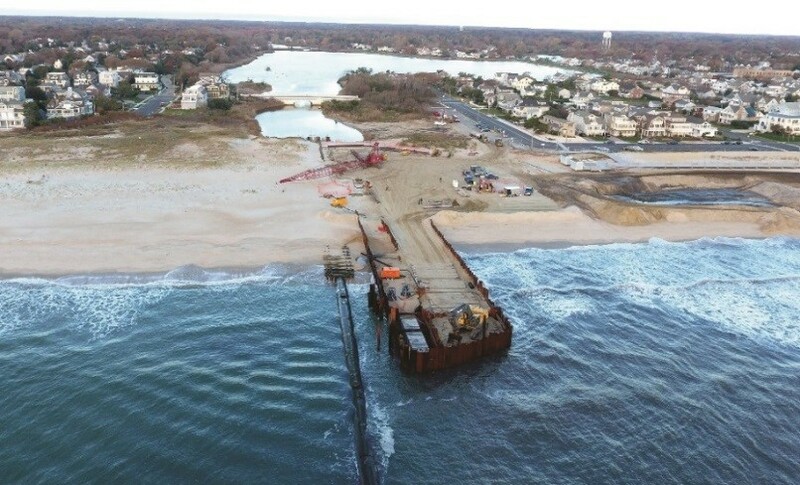 The Monmouth County Department of Public Works and Engineering is conducting a second phase of dredging as part of the overall restoration project. This work is expected to be completed by the end of this year. Work on creating more than a mile of living shorelines and a sand berm planted with native vegetation will begin in the spring. The Administration is funding the project through a $3.85 million grant from the DEP’s Flood Hazard Risk Reduction and Resiliency grant program and $608,000 from the DEP’s Corporate Business Tax grant program. The U.S. Department of the Interior provided a $2 million grant and the borough of Spring Lake is providing $915,000. The Sandy Hook-based American Littoral Society is administering the Department of Interior grant awarded to the U.S. Fish and Wildlife Service to pay for part of the culvert construction and a portion of berm construction. 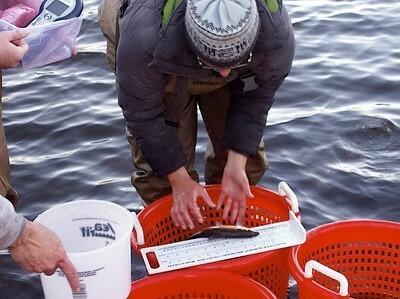 Students from Monmouth University are monitoring water quality and aquatic life in the lake as the project progresses. The Wreck Pond culvert – made up of a series of 5-foot-high by 8-foot-wide interconnected concrete boxes supported by pilings driven into the sand – is designed to effectively act as an inlet that can be managed through the operation of a gate during severe weather events. The gate can be closed at low tide in anticipation of heavy rainfall, creating more storage capacity for stormwater. When storm surge is predicted to be the primary weather threat, the gate can be closed to prevent the ocean from inundating the lake. At all other times, water in the culvert will rise and fall with tide cycles, improving water quality by allowing daily flushing of nutrients from the pond that can cause algae blooms that degrade water quality and impact fish and other aquatic life. This natural flow will also allow fish such as herring and eel to enter the pond and get to spawning areas. Killifish, Atlantic silverside, minnows and other small fish that forage for bigger fish will benefit from better water quality. The sand berm to be constructed in the spring will provide added protection against flooding while maximizing stormwater storage capacity. The berm will be planted with native vegetation that will create wildlife habitat and stabilize it against erosion. In addition, nearly 6,000 feet of living shorelines will be created around the pond and Black Creek. Living shorelines use native vegetation to prevent erosion, mitigate flooding, create habitat and improve water quality. The Wreck Pond watershed encompasses about 13 square miles of Wall Township and the boroughs of Spring Lake Heights, Spring Lake and Sea Girt. It is part of a string of unique coastal lakes in Monmouth County being restored after Superstorm Sandy through partnerships coordinated by the Christie Administration. The DEP in partnership with the U.S. Department of Agriculture’s Natural Resource and Conservation Service has already completed a variety of infrastructure repair and stabilization projects at Lake Fletcher, Lake Como, Lake Takanassee, Lake Wesley, Sylvan Lake and Deal Lake. Working with $50 million in funding from the U.S. Department of Housing and Urban Development, the DEP established the Flood Hazard Risk Reduction Resiliency grant program to fund projects to address outdated infrastructure connected to flooding problems. In addition to the $3.85 million in funding for the Wreck Pond project, the Flood Hazard Risk Reduction and Resiliency grant program provided $6.5 million for a canal pump station in Atlantic City, $6.2 million for an outfall project for Belmar’s Lake Como, $1.4 million for new stormwater pump stations in Brigantine, $914,000 for tide gate improvement in Little Ferry, $12.3 million for stormwater infrastructure improvement in Wildwood and $9.93 million for flood control in North Wildwood. 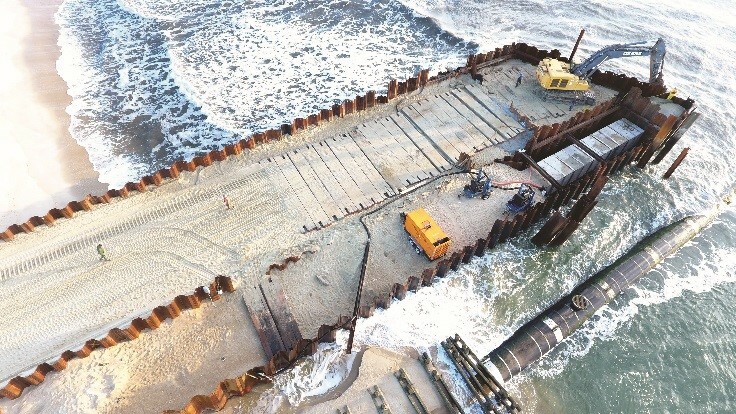 Major components of the DEP’s integrated post-Sandy resiliency strategy include working closely with the U.S. Army Corps of Engineers in building a statewide system of protective engineered beaches and dunes, purchasing flood-prone residential properties from willing sellers and converting them to open space to provide flood buffers, and providing financing to protect wastewater and drinking water infrastructure. PHOTOS/Top and Bottom: Courtesy of Simpson and Brown Inc.